Mr. Asahi is a robot barman currently on a demonstration run at Selfridges in London. Weighing at one ton, nobody talks back to Mr. Asahi. Mr Asahi can open beer bottles and serve pints in less than two minutes, knocking 13 minutes off the average 15 minute waiting time at the bar. At £100,000, he'll need to be better than average. ...Taste became taste as he sipped the cognac that the robot bartender handed him. ...He ignored his enemies and examined the perpetual beam carved in the robot face of the bartender, the classic Irish grin. Other mentions include the robot bar from a 1965 Harry Harrison novel. Also, Star Trek: The Next Generation fans may recall the episode in which their memories are erased; Data assumes the job of bartender in Ten Forward. 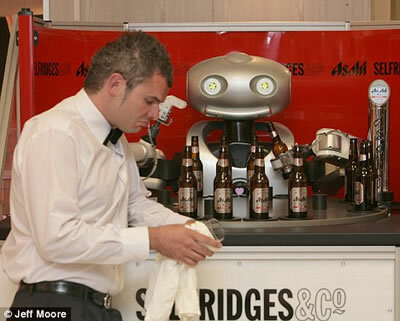 Via World's first robotic barman; thanks to Moira for the tip on this story.